At a weight of only 19 lbs., the “Super-Lite” is the lightest-weight, all-purpose set of ramps on the market and… it is rated with a whopping weight limit of 1500 lbs for the pair! Another great feature---the panels are not connected and can be used for loading vehicles with different wheel spacing widths. 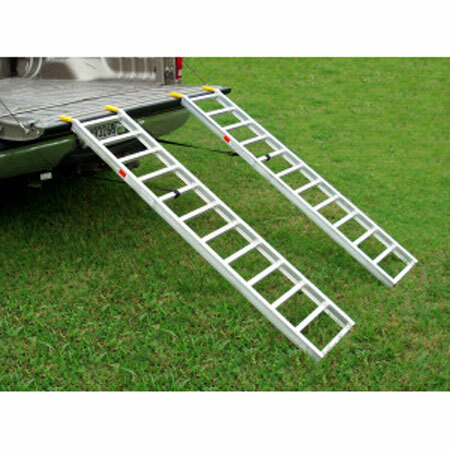 This ramp is perfect for those who want a feather-weight, dependable set of ramps that performs for loading a variety of off-road vehicles. 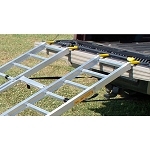 The 14-inches W x 71-inches L dimensions and 5-inches rung spacing makes the Super-Lite ideal for loading ATV’s, Lawnmowers, etc. You can even use one panel as the perfect ramp for dirt bikes, small street bikes and scooters. 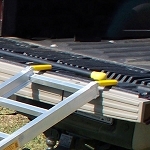 The Super-Lite is constructed of aircraft aluminum and comes with safety straps and soft-plastic tailgate protectors. Ships by UPS.